D&C BLOG :: A Market Update from D&C! With the available housing inventory remaining low, buyers are waiting and HAVE been waiting since the fall. However, inventory levels are expected to rise late April, early May which will slow down the “feeding frenzy” that we’re currently experiencing. Mostly, we are seeing first time move up buyers circling in this market, so if your home is under $500k, a multiple offer situation is more than likely. This highly competitive season certainly merits working with an experienced agent to purchase your next home, but if you are thinking of selling, your home’s market value is enhanced in this season. Diane & Crew is a versatile team with a passion for design. From farmhouse to traditional, staging for the right buyer will also merit a greater sales price and a quicker sale for your home! 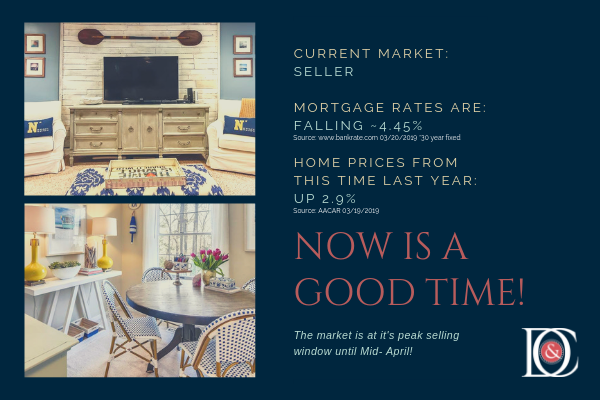 If you have any questions on this intense spring market, listing your home, or staging advice– please reach out to us!